Here are a few examples of the work my masters students in Barcelona, Catalonia, produced during the Spring of 2012. This first project, by Martín Rocca and Gonzalo Sarasqueta, portrays Diego Rey, an Argentine artist working in Barcelona. This second slideshow, by Judit Pedros and Alba Fernández, introduces a local tattoo artist conflicted by her maternal role. This project by Ariadna Marrugat and Albert Gandia features an interview with Rugby player James Oliver. In Jordan Nelson and Alfredo Casas’ piece, two veterinarians talk about their patients (and their owners). Daniela Caruso and Héctor Leyva visited one of the oldest Catalan cava bars in the city. In Barcelona, jugglers get together every Wednesday afternoon to practice and learn from each other, in this piece by Paula Acebo and Rosa Brescó. Camila Pinzón and Teresa González interviewed a group of skaters who train at the Museum of Modern Art of Barcelona (MACBA). Fencing and architecture merge in David Boldú’s life. And this is featured in this piece by Jessica Bigio and Javier Morera. Jessica Sauras and Alvaro Murillo talked to Luis Romero, a 81-year-old activist and member of the Catalonian Communist Party. Clara Berdié,Juan Irigoyen and Marc Martí found Barcelona Fútbol Club’s mythical shoe repairer. Carmen Hierro Rico and Jessica Mouzo followed Jose Rodríguez, 23-year-old store clerk who feels lucky to still have a full time job in a time of severe unemployment in Spain. From our old friend Ira Glass, a few words of wisdom. You should never give up! The audio is from this video by current.tv in which an unedited Glass talks at length about deadlines. This following video is Glass on storytelling and structure of radio and TV stories. You’ll love it! Finally, Glass on how hard it is to actually find a good story. The debate around long form narrative journalism and it’s growing potential on the web has been gaining momentum. So, I just wanted to share with you two stories and hear your ideas/comments about them. In the first article, Forbes‘ Lewis DVorkin argues that now that we can access to data on how long people stay reading a web page, how far down readers will scroll, and how many clicks deep into a story they are willing to go, we can assess with accuracy whether readers enjoy shorter or longer pieces online. According to Forbes’ data, and contrary to what newspaper editors thought in the past, long form journalism for the web not only interests readers but is also key to business success. Thanks to statistics (Google Analytics and so many others) but also to social media, we can now measure and more importantly see how the “social conversation evolves” around news articles (FB “likes” and “shares” and Twitter “hashtags”). Tapping into these tools, what DVorkin found is that longer, well researched pieces have exponentially higher readership than shorter snippets, or lesser researched pieces. His recommendation: long and short form should work hand in hand. Short form will generate interest in the story (something like a teaser) and long form will deliver the bulk of the content. 4- The rise of shifting apps like Read it Later (indirectly, also, the spread of WiFi) This fourth one is particularly amazing, because Read It Later shows data on hundreds of millions of stories saved to be read in portable devices while users have no access to the internet. But, in fact, the mere existence of Long Reads or The Atavist, a search engine and a market platforms exclusively developed to find and market long form narrative journalism stories, speaks to the resurgence of this genre. My questions to you: how do you think this new trend could affect your career? Could these new trends affect the way you will approach your studies or your job search? Please read the articles and post a brief answer to my questions. Writing a good review is not easy. Primarily because you need to have enough information to make your impressions and ideas valuable to the readers. To start, you need to know meticulously the object of your review. Your readers will use your assessments to judge whether the movie/play/video game/culinary experience is worth their time and attention. So you need to offer them enough references, introduce enough ideas and comparisons to help them make that decision on their own. A good review describes its object in detail. If it’s a play, you’ll devote equal time to each act. If it’s a movie, you’ll pay attention to relevant scenes. If it’s a meal, each course will get its own paragraph. But when assigning your editorial space, you will always leave some aside to discuss the most salient aspects of the piece. A good review is a direct look into the eyes of the artist. With your most sincere, honest words, you will describe not only the experience but also the feelings it triggered in you. Sometimes those feelings will be of boredom and disgust, sometimes they will be of joy and amusement, and on rare occasions (very rare) they will be of pure amazement. Here are a few reviews you may find useful when working on your own! Roger Ebert’s reviews are always a good reference. Here’s one on Coriolanus, directed by Ralph Fiennes. Finally, here’s a review I wrote about The Limits of Control, by Jim Jarmusch for the New York Daily News, based on an interview with actress Paz de la Huerta. I created a few videos that should teach you the basics on how to work with buttons in order to add interactivity to your graphics using Flash CS5.5. The first video shows you how to create a graphic and a button. The second video shows you how to add instances to your buttons. The third video explains how to add a hyperlink to your flash button. The fourth one covers the use of the “hit” position. Geoff McGhee is an online journalist who works on data visualization at Stanford University, where he has produced Journalism in the Age of Data. 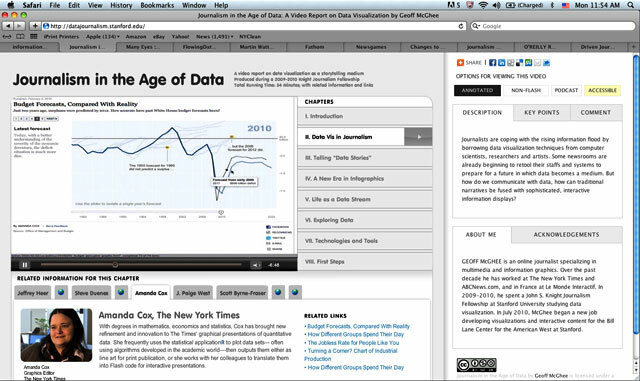 The project, which encompasses a video documentary on different approaches to data visualization, has a segment dedicated to journalism, and discusses how “Data Vis” is starting to create changes in newsrooms. Other websites to pay attention to are Many Eyes which has an application that helps you convert your data (in Excel) into visual information, and DJB (Data Journalism Blog) created by digital journalist Marianne Bouchart. Also, if you haven’t checked them out yet, Flowing Data, Infosthetics and Fathom are great resources. Martin Wattenberg’s site Bewitched is also full of great ideas. Wattenberg is a co-leader, with Fernanda Viégas, of Google’s “Big Picture” data visualization group. Adding clips to your Final Cut Pro X project is very simple, and here’s how you do it. Do you need to add some transitions? Check out this clip. Finally, here’s a good tutorial on how to do color correction in FCPX. It also teaches you how to correct some problems with exposure. Sometimes video as part of a multimedia piece overlaps with the written part of the story, like in this piece from the New York Times. Some other times, video and audio show an aspect of the story that was hard or impossible to reveal in words.